The procedures listed below are for the RH side. (a) w/o Rear No. 2 seat: Remove the deck board (see page 76-21 ). (b) Remove the rear No.1 seat RH (see page 72-35 or 72-54 ). (c) Remove the rear seat belt assy inner RH. (1) Remove the bolt and belt. (d) Install the rear seat belt assy inner RH. (1) Install the belt with the bolt. (a) w/o Rear No. 2 seat: Remove the deck board (see page 76-21 ). (b) Remove the rear No. 1 seat RH (see page 72-35 or 72-54 ). (c) Remove the rear seatback cover (see page 72-35 or 72-54 ). (d) Remove the rear seat outer belt assy center. (1) Remove the nut, bolt and belt. (e) Install the rear seat outer belt assy center. Check the degree of tilt when the belt begins to lock the ELR. NOTICE: Do not disassemble the retractor. When the inclination of the retractor is 15 or less, check that the belt can be pulled from the retractor. When the inclination of the inclination of the retractor is over 45 check that the belt locks. If operation is not as specified, replace the belt assy. Install the seat belt with bolt and nut. Install the seatback cover (see page 72-35 or 72-54 ). NOTICE: Do not allow the anchor part of the rear belt and the protruding parts of the seat cushion frame to overlap. With the belt installed, check that the belt locks when it is pulled out quickly. 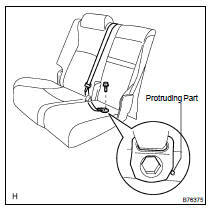 If operation is not as specified, replace the seat belt assy. NOTICE: The check should be performed with the assembly installed. (b) Remove the rear No. 1 seat LH (see page 72-35 or 72-54 ). 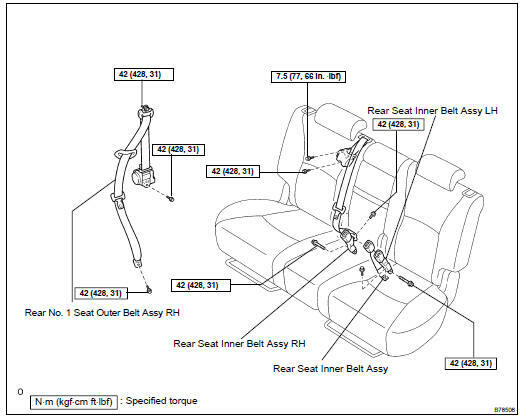 (c) Remove the rear seat inner belt assy. Remove the bolt and belt. (d) Install the rear seat inner belt assy. Install the belt with the bolt. NOTICE: Do not allow the anchor part of the rear belt and the protruding parts of the floor panel to overlap. (b) Remove the rear No.1 seat LH (see page 72-35 or 72-54 ). (c) Remove the rear seat inner belt assy LH. (d) Install the rear seat inner belt assy LH. (a) Remove the tonneau cover (see page 76-21 ). (b) Remove the deck board cover (see page 76-21 ). (c) Remove the deck board cover No. 2 (see page 76-21 ). (d) Remove the deck board cover No. 3 (see page 76-21 ). (e) w/ Rear No. 2 seat: Remove the rear seat reclining cover RH (see page 76-21 ). (f) Remove the deck floor box RR (see page 76-21 ). (g) w/o Rear No. 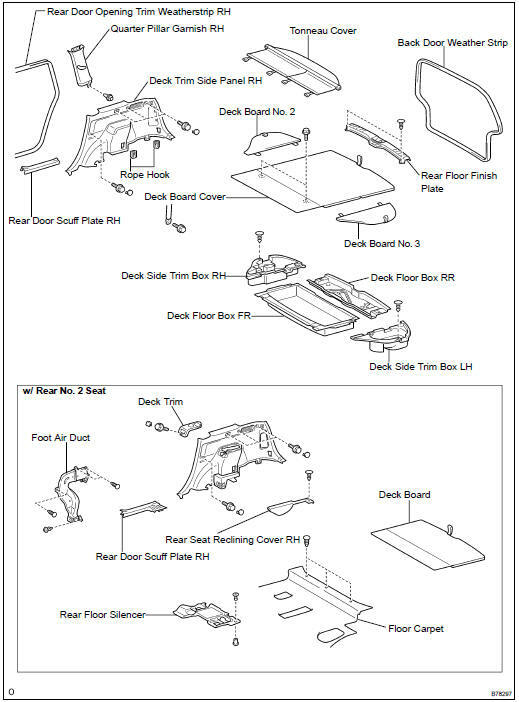 2 seat: Remove the deck floor box FR (see page 76-21 ). (h) Remove the rear floor finish plate (see page 76-21 ). (i) Remove the deck side trim box LH (see page 76-21 ). (j) Remove the deck side trim box RH (see page 76-21 ). (k) Remove the rear No. 1 seat LH (see page 76-21 ). (l) Remove the rear No. 1 seat RH (see page 76-21 ). (m) Remove the rear door scuff plate RH (see page 76-21 ). (n) Remove the rear door opening trim weatherstrip RH (see page 76-21 ). (o) Remove the back door weatherstrip (see page 76-21 ). (p) Remove the rope hook (see page 76-21 ). (q) Remove the deck trim side panel RH (see page 76-21 ). (r) w/ Rear No. 2 seat: Remove the quarter pillar garnish RH (see page 76-21 ). (s) w/ Rear No. 2 seat: Remove the 3 clips and turn over the front floor carpet. (t) w/ Rear No. 2 seat: Remove the 2 clips and rear floor silencer LH and RH. (u) w/ Rear A/C: Remove the 4 clips and foot air duct rear. (v) Remove the rear seat outer belt assy RH. Remove the bolt and shoulder anchor. (w) Install the rear seat outer belt assy RH. Install the belt assy with the bolt, as shown in the illustration. Install the rear outer belt with the bolt. NOTICE: The check should be performed with the outer belt assy installed. Check the fastening function of the child restraint system. When the belt is pulled out fully, the belt should automatically try to retract. After the belt has fully retracted, the belt should be able to be pulled out and retracted again.